If your idea of the perfect getaway is to catch the “big” one, you’re in luck! At Elkins Resort there are no surprises when it comes to fishing on Priest Lake. The lake is easily accessible and everyone is welcome to throw in a line! Elkins Resort is located at Reeder Bay, practically in the center of the 25 mile long lake. Priest Lake contains 40 square miles of “lucky fishing spots,” so everyone from the youngest of fishermen to seasoned veterans will find something to catch! Claim us as your annual fishing trip location with your friends and family this year! If a calm and lazy fishing day is part of your ideal vacation, Priest Lake is an excellent destination for those who just want to cast a line and breathe in the mountain air. For the more serious angler looking for that “Trophy Trout” of a lifetime, the Mackinaw (lake trout) is the predominate species found in Priest Lake and large fish are commonly hooked. According to the official Priest Lake website, the Idaho state record for a Mackinaw was caught at Priest Lake in 1971, weighing in at 57.5 pounds. Open all year round, guests at Elkins Resort have multiple chances to bring home that perfect sized fish. During the summer months, fishers can reach lake trout at depths of 100-feet or deeper. During the late fall to early spring, Mackinaw can be caught closer to the surface and in relatively shallow water. 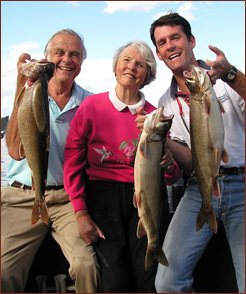 With a harvest limit of six lake trout per day, fishing on Priest Lake is perfect for long afternoons with family and friends or for just relaxing alone. The picture perfect view on the lake is worth the fishing trip alone! Elkins Resort offers boat slip rentals so you may bring your own fishing boat and explore the lake as long you please. Fish on the water from early morning until nightfall and enjoy a restful night’s sleep in one of our cedar log cabins. With comfortable lodging you’ll be fresh and back at it the next day. Check out our resort lounge, which is perfect to recall the day’s fishing events over drinks and appetizers. For your fishing adventures we recommend Rich Lindsey at Priest Lake Guide Service. Rich personally books and guides all fishing adventures, and takes great pride in delivering exactly what you expect. Please be sure to bring your Idaho fishing license for anglers 14 years and older. Fishing boat (14’) rentals are available to rent through Elkins Resort at $80/day or $60/half day. Since 1932, Elkins Resort is the most trusted boat rental company on Priest Lake. Choose which boat fits your family to enjoy sandy beaches, breathtaking views and fun on the water. Elkins Resort offers a wide variety of truly spectacular activities. Boating on beautiful Priest Lake, hiking in the Selkirk mountain range, Golfing at 18-hole Priest Lake Golf Course, fishing, mountain biking, paddle boarding, movies on the lawn, beach volleyball, snowmobiling and snowshoeing.